What is included in the Geographic Regions of NYS Lesson Plan? I’m working my way through the NYS 7th grade Social Studies standards and curriculum for my site, http://www.teacherspayteachers.com/Store/Kasha-Mastrodomenico. This was a really fun lesson plan for me to make because I grew up in Rochester, NY and am familiar with every region in NY through various trips and moves. The content that the Geographic Regions of NYS lesson plan and PowerPoint cover is found below. The PowerPoint is filled with beautiful pictures that will bring each region to life for students. The essential questions and vocabulary will help student focus on the content. 3 different levels of vocabulary sheets; basic, average and enriched. Each ability level allows students the choice between linguistic or spatial intelligence by offering them the choice of using the vocabulary word in a sentence or drawing a picture to show understanding. Expository paragraph writing assignment with grading checklist bring in the Common Core Standards CCSS.ELA-Literacy.W.7.2. To find out where to obtain the Geographic Regions of NYS Lesson Plan and PowerPoint mini-lesson, click here! You can find a list of my social studies differentiated instruction lesson plans that follow the NYS standards and curriculum by clicking here. This entry was posted in New York State Social Studies, Social Studies Differentiated Instruction, Social Studies Differentiated Instruction Lesson Plans and tagged 7th grade NYS Social Studies, 7th grade NYS social studies standards, Geographic Regions of New York lesson plan, Geographic Regions of New York State lesson plan, Geographic regions of NY lesson, Geographic Regions of NYS lesson plan, New York State Geographic Regions lesson plan, NYS 7th grade social studies curriculum, NYS Geographic regions, NYS Geographic Regions lesson plan, social studies differentiated instruction, social studies lesson plan on September 18, 2012 by Kasha Mastrodomenico. Where can you find a New York State Geographic Regions lesson plan? Click on the links below to find out more about the NYS Geographic Regions Lesson Plan and PowerPoint mini-lesson. What does the Geographic Regions of NYS PowerPoint and lesson plan include? You can find a chart that lists all of my social studies differentiated instruction lesson plans that follow the NYS standards and curriculum as well as the Common Core by clicking here. This entry was posted in New York State Social Studies, Social Studies Differentiated Instruction, Social Studies Differentiated Instruction Lesson Plans, Social Studies PowerPoints and tagged 7th grade NYS social studies standards, Geographic Regions of New York, Geographic Regions of New York lesson plan, Geographic Regions of New York State lesson plan, Geographic Regions of NY lesson plan, Geographic Regions of NYS, Geographic Regions of NYS lesson plan, NYS Social Studies Curriculum, NYS Social Studies Standards, social studies differentiated instruction on September 18, 2012 by Kasha Mastrodomenico. 2 activity options with grading rubrics: Cheer and Storybook. These are fun activities that are based on the Multiple Intelligence Theory. They help to engage students in the content. It also allows for student choice. For information about the The Advanced Civilization of the Aztec PowerPoint that goes with this lesson, click here! The Aztec lesson plan that uses differentiated instruction is part of a new series on http://www.teacherspayteachers.com/Store/Kasha-Mastrodomenico. It is a great site for any middle school social studies teacher that is looking for an easy and fast way to differentiate instruction for their students. This entry was posted in Differentiated Instruction, Differentiated Instruction Lesson Plans, Native American Differentiated Instruction Lesson Plans, New York State Social Studies, Social Studies Differentiated Instruction, Social Studies Differentiated Instruction Lesson Plans and tagged Aztec differentiated instruction lesson plan, Aztec Lesson Plan, differentiated instruction, social studies differentiated instruction, social studies differentiated instruction lesson plan, social studies differentiated lesson plan, social studies lesson plan, The Advanced Civilization of the Aztec, The Advanced Civilization of the Aztec Differentiated Instruction Lesson Plan, The Advanced Civilization of the Aztec lesson plan on September 2, 2012 by Kasha Mastrodomenico. 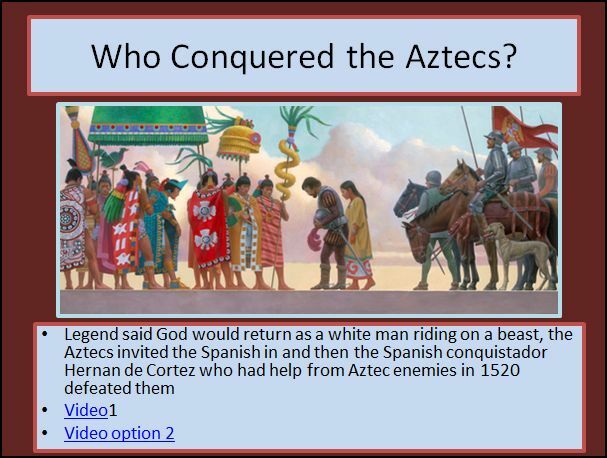 The Advanced Civilization of the Aztec PowerPoint Mini-Lesson is now available at http://www.teacherspayteachers.com/Product/The-Advanced-Civilization-of-the-Aztec-PowerPoint-Mini-lesson! A review song to the tune of “Here we go round the Mulberry Bush” to help your students remember the content by bringing in the Musical Multiple Intelligence. To learn about The Advanced Civilization of the Aztec Differentiated Instruction lesson plan, click here. http://www.teacherspayteachers.com/Store/Kasha-Mastrodomenico helps social studies teachers differentiate instruction for their students quickly and easily. This entry was posted in Differentiated Instruction, Native American Differentiated Instruction Lesson Plans, New York State Social Studies, Social Studies Differentiated Instruction, Social Studies Differentiated Instruction Lesson Plans, Social Studies PowerPoints and tagged Aztec Lesson Plan, Aztec PowerPoint, Aztec PowerPoint mini-lesson, differentiated instruction, New York State Social Studies Core Curriculum, New York State Social Studies Standards 7th grade, social studies differentiated instruction, The Advanced Civilization of the Aztecs Lesson, The Advanced Civilization of the Aztecs PowerPoint Mini-Lesson on September 2, 2012 by Kasha Mastrodomenico. Inca Differentiated Instruction Lesson Plan! The Advanced Civilization of the Inca Differentiated Instruction lesson plan is now available at http://www.teacherspayteachers.com/Product/The-Advanced-Civilization-of-the-Inca-Differentiated-Instruction-Lesson-Plan! For information about the The Advanced Civilization of the Inca PowerPoint that goes with this lesson, click here! To bring in the Musical Multiple Intelligence I created a great review song that is at the end of the PowerPoint. It will help your students remember the content. The Advanced Civilization of the Inca Differentiated Instruction lesson plan is part of a new series on http://www.teacherspayteachers.com/Store/Kasha-Mastrodomenico. It is a great site for any middle school social studies teacher that is looking for an easy and fast way to differentiate instruction for their students. This entry was posted in Native American Differentiated Instruction Lesson Plans, New York State Social Studies, Social Studies Differentiated Instruction, Social Studies Differentiated Instruction Lesson Plans and tagged differentiated instruction, Inca differentiated instruction lesson plan, Inca lesson plan, social studies differentiated instruction, The Advanced Civilization of the Inca, The Advanced Civilization of the Inca Differentiated Instruction, The Advanced Civilization of the Inca Differentiated Instruction lesson plan, The Advanced Civilization of the Inca Lesson Plan on September 2, 2012 by Kasha Mastrodomenico. You can find The Advanced Civilization of the Inca PowerPoint mini-lesson at http://www.teacherspayteachers.com/Product/The-Advanced-Civilization-of-the-Inca-PowerPoint! 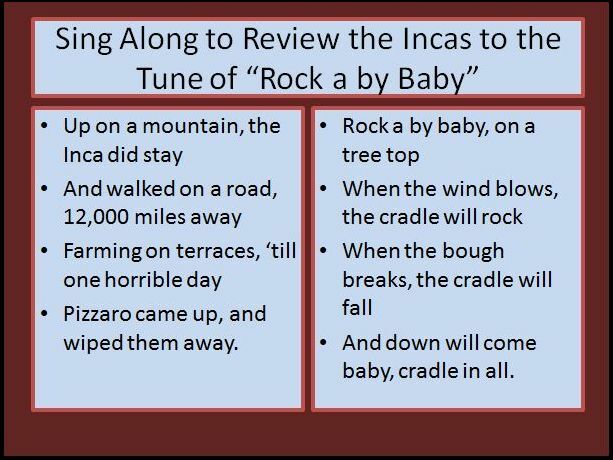 Click here to see what’s included in the full The Advanced Civilization of the Inca differentiated instruction lesson plan! This entry was posted in Native American Differentiated Instruction Lesson Plans, New York State Social Studies, Social Studies Differentiated Instruction, Social Studies PowerPoints and tagged 7th grade NYS Social Studies, differentiated instruction, Inca lesson plan, Inca PowerPoint, Native American differentiated instruction lesson plans, Native American Lesson plans, New York State Social Studies, New York State Social Studies Core Curriculum, social studies differentiated instruction, Social Studies PowerPoints, The Advanced Civilization of the Inca, The Advanced Civilization of the Inca PowerPoint on September 2, 2012 by Kasha Mastrodomenico.